Airbus Defence and Space has developed and delivered the qualification model of the solar array for the European Service Module (ESM) of the Orion crewed spacecraft. During a deployment test today at NASA’s Plum Brook Station facility in Sandusky, Ohio (USA), the model came through the test with flying colours. The tested solar array involves one qualification wing, consisting of a yoke and three panels, and three dummy wings. 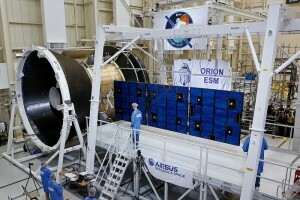 In the past month, the solar array was integrated with the test model of the Orion ESM, of which the series is being developed and built by Airbus Defence and Space on behalf of the European Space Agency (ESA). The solar array deployment test is part of a series of dynamic tests that the ESM will undergo in the coming months at the NASA centre to prove that its design can withstand the hostile environment of an exploration flight beyond the Moon.